A marriage heads over a cliff, literally, in Garret Jon Groenveld’s The Empty Nesters, a co-production of PlayGround and Virago Theatre Company and part of PlayGround’s 19th annual Festival of New Works. Luckily, the cliff in question is on the western rim of the Grand Canyon, and there happens to be a popular tourist spot called Skywalk that allows visitors to make a u-shaped jaunt on a glass walkway, with the canyon floor more than 3,000 feet below them. While waiting in line for the glass-bottom trek, amid a lot of familiar-sounding squabbling of longtime marrieds, Frances drops a bomb that throws this little Arizona sojourn into a whole different light. San Francisco playwright Groenveld offers three distinct chapters in this tale of a day in the life of a marriage at a crossroads. The first is at the canyon’s rim. The second is in a busy café, and the third is in a nearby hotel room. Each section delves deeper into the nature of this marriage, which actually seems to be a sturdy marriage built on love and companionship and not a lot of excess drama. At play’s end, just over an hour after it began, Groenveld makes a bold shift in his storytelling that turns Frances and Greg into characters in their own story as they recount a seemingly unimportant few minutes that turns out to be much more vital than they realized. 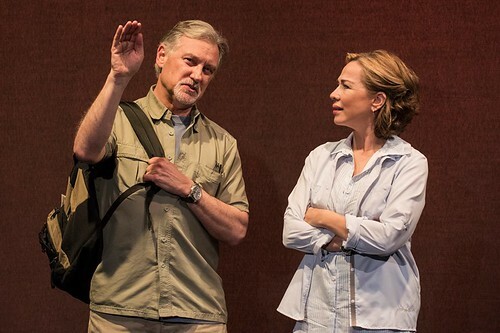 Directed by Amy Glazer, The Empty Nesters has a natural rhythm that subtly builds tension and deepens the connection between husband and wife, thus raising the stakes. Married 25 years, Frances and Greg have fallen into distinct patterns of disengagement with each other. She has focused primarily on work and the kids (mostly the kids). He has focused on work and sports (mostly “SportsCenter,” the Dodgers, the Lakers and televised poker tournaments). Now that it’s just them again, they have a big readjustment to make. They acknowledge that they knew this time would come, but it came more quickly than they realized, with the surprise being an unexpected, unfamiliar and uncomfortable stretch of mid-life without children and retirement still years away. We’ve seen bickering couples with faltering marriages before, but this couple feels more grounded in reality. It’s never a sure thing that hiring a married couple to play a married couple is going to work in the characters’ favor, but here, under Glazer’s sure directorial hand, there’s a big payoff. The Walkers give us recognizable types – he’s whiny and a little clueless, she’s constantly annoyed and feeling unseen. But Groenveld takes us beyond those façades, and the Walkers open up the emotional lives of these spouses with warmth and compassion. It’s also helpful that there is abundant humor. They’re going through a rough patch, but they both get off a few good laugh lines every now and then. Once we’re into the motel room scene, it’s easy to empathize with Frances and Greg – there’s no real bad guy…other than time and marriage (or the challenge of) itself. There’s a kind of sexual tension hovering over the scene – not the good kind – and you begin to see how they could easily break apart at this point. But you also sense the depth of their connection and feel the enormity of what they have to lose. That’s what gives The Empty Nesters its edge and makes it feel much heftier than its brief running time. Garret Jon Groenveld’s The Empty Nesters continues through June 14 as part of the19th annual PlayGround Festival of New Works at Thick House, 1695 18th St., San Francisco. Tickets are $25-$55. Call 415-992-6677 or visit www.playground-sf.org.